Martin McCormick’s latest play is a scabrous meditation on domesticity. 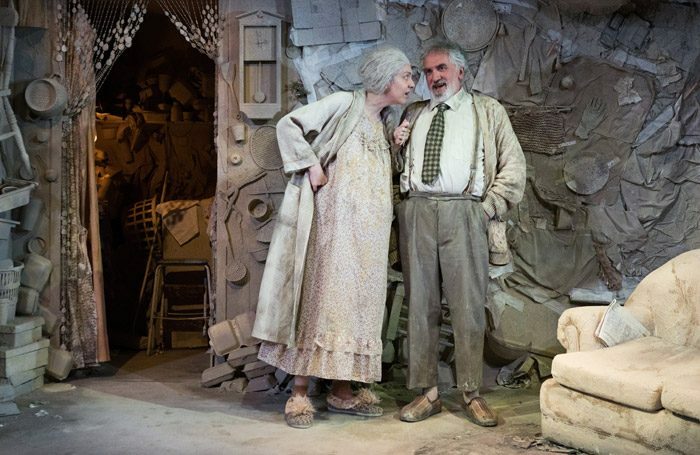 Charlotte Lane’s set, which looks like the contents of a junk shop vomited onto a stonemason’s floor, is the otherworldly home for Ma (Karen Dunbar) a seemingly pregnant Rottweiler of a woman, and Pa (Gerry Mulgrew) her put-upon husband “without a trade”. Their days are spent bickering, as Pa laments his long lost cherubic looks, and Ma delights in verbally castrating him. The tension is further exacerbated when a stranger Neil (Nalini Chetty) is brought in by Pa after she suffers a traumatic incident on the street. Her presence upsets their casually callous exchanges. What follows is more surrealist than absurdist, a discomfiting living room showdown with three increasingly brilliant,unhinged performances. Pa is not the underdog he first appears to be; Ma’s jealousy of the attractive young woman becomes vicious, and there’s an unlikely Gary Glitter karaoke turn, which, given the fallen-from-grace 1970s pop star’s history, carries an uncomfortable weight. Neil, as the timid third wheel in the couple’s machinations, has her own dark secrets to reveal. McCormick’s lyrical text – all blood and bone, and “little mouths swallowed up by snakes” – feels like a Nick Cave song played as background music at a Scottish wake. Ross Brown’s evocative score crackles with static and malevolently Lynchian low humming. The spectres of loss and sorrow are never far away in the unexpectedly affecting writing. McCormick’s brutal collision of homilies and cliches with screaming monologues expose the bare floorboards of the family home as a source for comfort. It’s sick, truthful and very funny, even as it takes aim at the jugular.